Focusing on the benefits of yoga for adults, it is easy to miss how beneficial it is for children. We think of children as being resilient and above the stress of everyday life, able to ignore it, play through, even sleep through it. Youth doesn’t seem to have sore muscles. Stiff necks must never bother them! Stress does take its toll on kids and physical inactivity is causing our children to gain weight at alarming rates. Starting a yoga practice for kids will help them deal with stress, teach body awareness, improve coordination and flexibility. Yoga also prepares their bodies for other physical activities like sports and rigorous play time. So many of the activities we have our kids involved in are competitive. In school, they are striving for grades. After school, they are competing on sports teams which become more and more competitive as they get older. Throw self-image into the mix and kids have a lot to think about, worry about, and deal with. In today’s world, children are often dealing with adult issues as well, like divorcing parents, or the death of a loved one. These traumas and difficulties can cause repercussions that can have lasting effects on a child’s life. Yoga offers an alternative and a place to find calm and play in the midst of this hectic world. Yoga can also have a positive effect on children mentally, too. It helps with concentration and encourages calmness. This can help with school work, attention disorders, and aggression. Teaching yoga to children is actually teaching them how to care for themselves and to listen to their bodies. Having self-calming skills, like those taught through yoga practice, will better equip children to navigate life’s stresses with deeper calm and higher self-esteem. Yoga helps physically by keeping growing muscles and joints flexible and limber. Weight bearing poses, like downward dog, improve muscle strength and tone, while encouraging young bones to absorb calcium. Whether athletes or not, yoga will also help with balance and coordination, posture and body awareness. 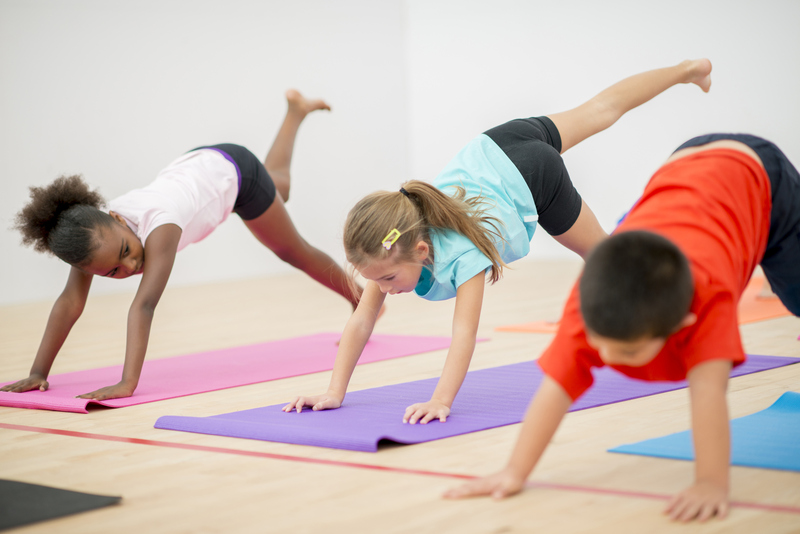 With so many temptations to sit and watch TV or play video games, yoga is a fun way to get kids up and moving and reconnecting with their bodies. After all, adults are not the only ones sitting behind desks all day long. Taking care of their bodies through yoga will also encourage kids to be receptive to mom’s urging to eat their vegetables. When they begin to connect the idea of caring for their bodies in yoga, this will cross over to caring for their bodies with food. With some guidance and good examples to follow, good nutrition won’t be such a struggle to achieve. In so many ways, yoga benefits us. It benefits kids, too. It can become a physical discipline which they can do throughout their entire life time. It can also be a fun activity you can do with your children, involving the whole family in a wholesome, playful activity that encourages openness and connection. Beginning a yoga practice for kids in your home will bring benefits to your whole family.